My friend Heather recently moved and I am having so much fun talking about and helping her dream up plans to decorate her new house. It’s so much fun seeing her get ready for all her firsts at the new house, -first fall, first Christmas, first parties and thinking about what she’ll do. 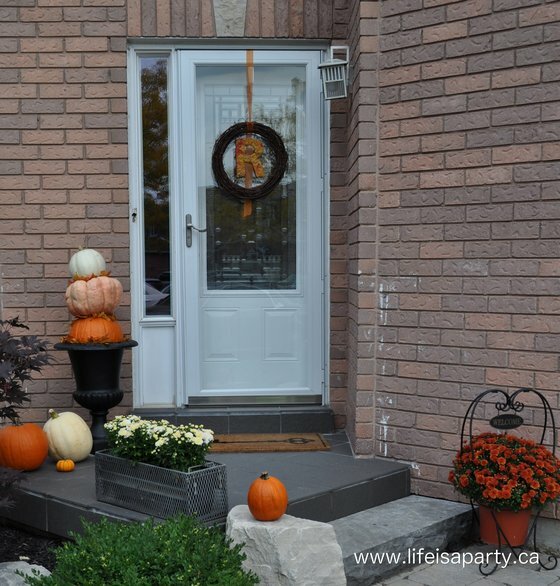 On the weekend I helped out with a little fall front door decorating and I’m excited to share the details with you. 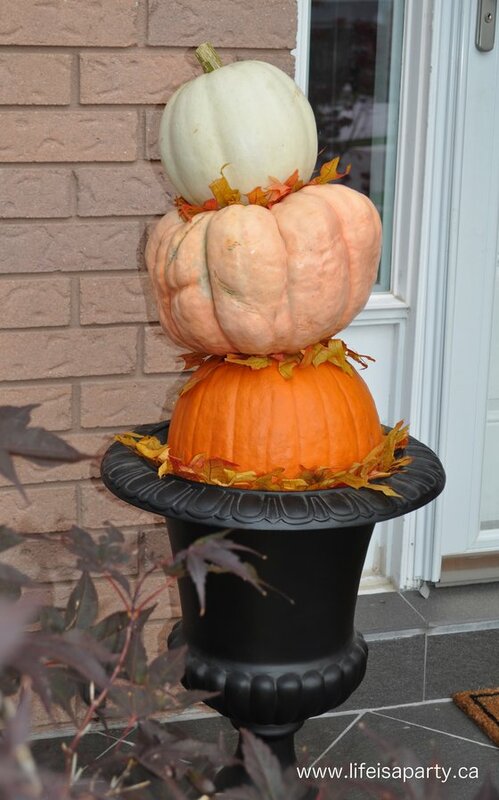 I started out with the idea of doing a pumpkin tower in a garden urn. I found the urn at Lowe’s, in the garden section. It was kind of a happy accident to come up with the ombre effect with the pumpkins, and I love how it came out. 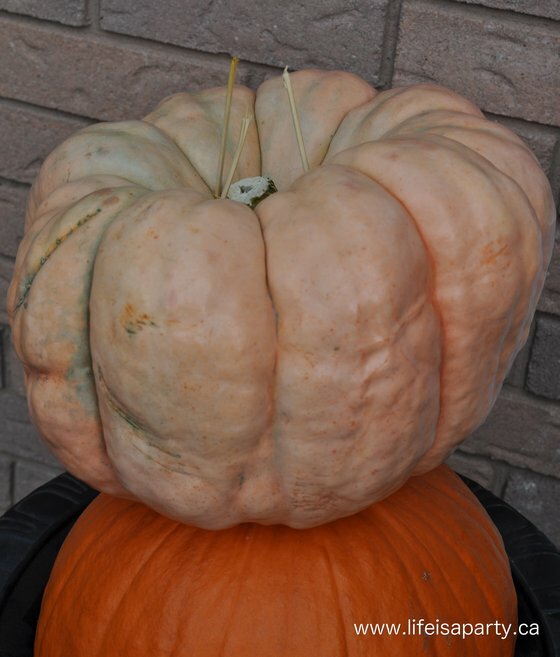 We started with a standard big orange jack-o-lantern pumpkin on the bottom. We used simple wooden skewers to help hold the second and third pumpkins on top. I didn’t want to use too large of a stake or dowel in the middle because we used real pumpkins, it’s unseasonable warm here right now, and I was afraid they might start to go bad too quickly. On top of the large orange pumpkin I stacked on the “pink” pumpkin -it’s a pink rose variety, and I found it at Loblaws, in case any of my local peeps are looking. 😉 Finally we used a smaller white pumpkin on top. I love the ombre effect from dark orange, lighter orange, to white that it creates. I used some glycerine treated fall leaves for the next step, they have nice vibrant colours and stay soft and flexible. I just tucked them in between each layer. 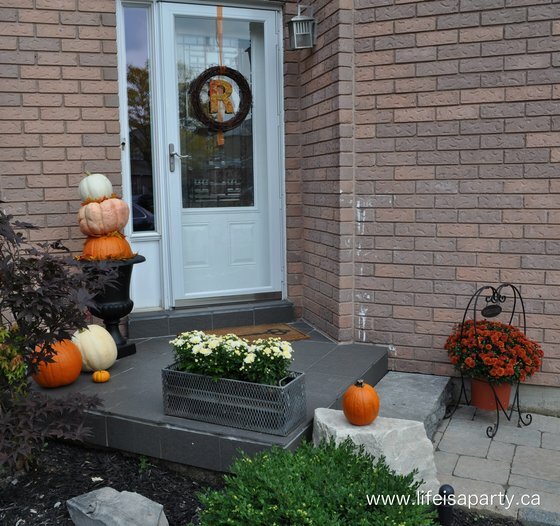 We also added some other pumpkins and some pretty fall mums. 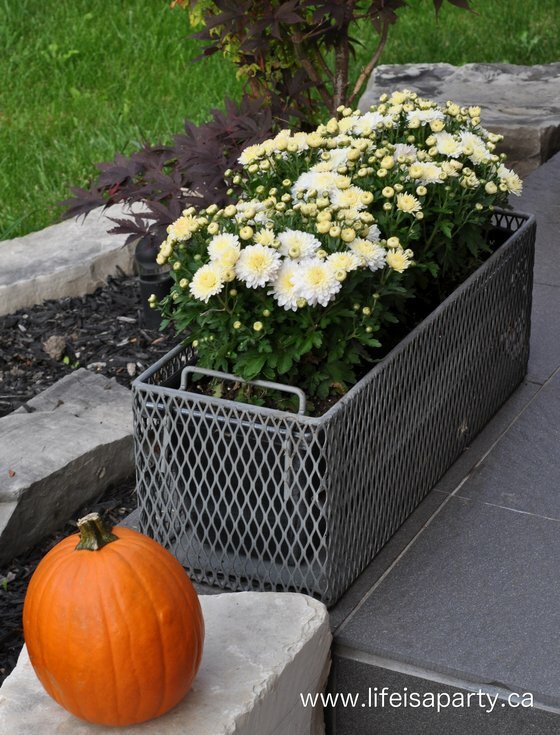 The long, wire mesh planter, filled with white mums, was a great Christie antique find a few years ago. On Heather’s door I made a simple wreath. I started out with a cardboard letter from the craft store, for their last name. I covered it in the same glycerine treated leaves. I glue gunned them in place, wrapping them around the edges, and then coated the letter in modgepodge to seal it. 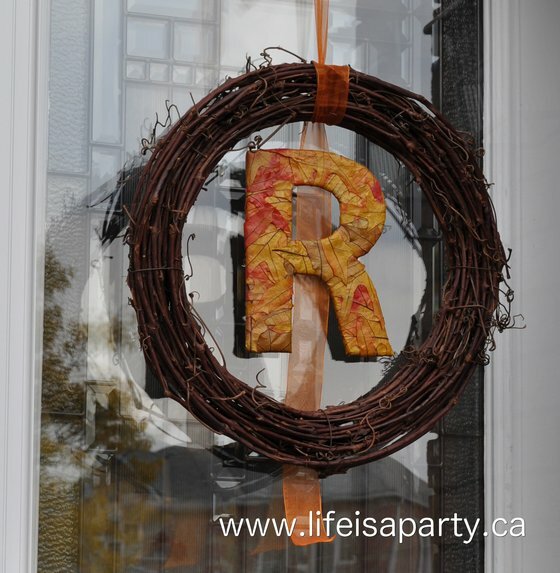 We used a simple grapevine wreath,and added the monogram with some simple ribbon. Sometimes less is more. 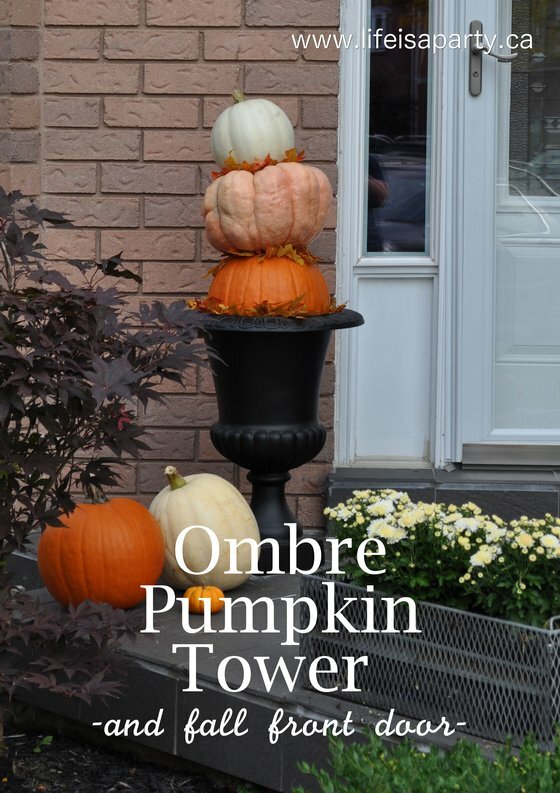 With an ombre pumpkin tower, life really is a party! This post is linked up at Tatertots and Jello’s Link Party Palooza, Craftberry Bush’s Inspiration Gallery, and The 36th Avenue. So cute! Sometimes the simplest designs are the best!